Coming across this map was unbelievable. Not only was it intriguing for us to learn about what type of zone we live in and whether we're subject to danger, but now we understand just how useful this map could be if war with North Korea becomes a reality. After taking a look at this map we are anxious to tell others about it. 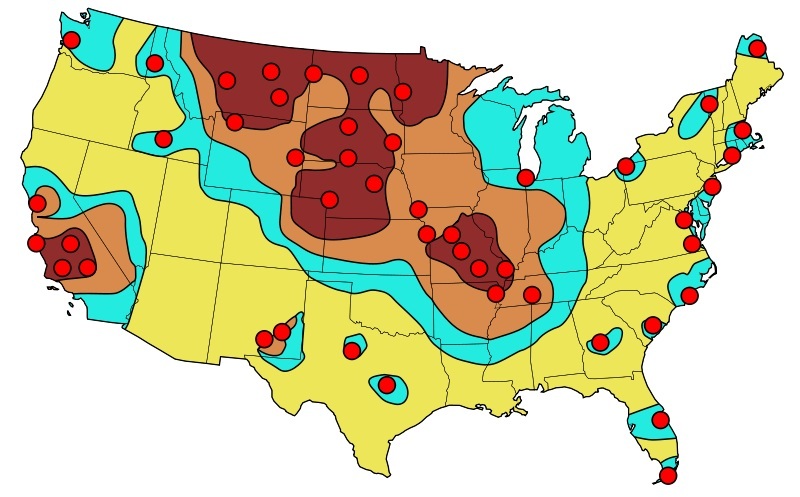 It's not only fascinating to study the zones, but it helps us realize what our chances are of being destroyed by a nuke. Now with the tensions that continue to rise over North Korea, Russia, Syria, and other potential disasters that could come up, we are ramping up in preparation for what is to come. This means getting our food stockpiled, increasing our water rations and creating more bug out shelters in anticipation for when SHTF. So before we spend our hard-earned money on building a state of the art fallout shelter, we may want to reconsider after seeing what our chances are of getting hit by a nuke. It may be time to relocate or build a bigger, better shelter! Find out by heading to the next page to check out the map. Didn’t show me anywhere. but California. What about Georgia?